"Aw, c'mon, Henry. This is ridiculous: you've gotta be with me." Probably the best political road movie, almost a primer of American Democratic Presidential politics. Great direction by Mike Nichols, solid performances and a sensational script (by Elaine May). The book published by Anonymous (Joe Klein) is a roman à clef about the Bill Clinton comeback campaign of 1992. Profane, salty, clever, hilarious and sad, it is a fascinating story of the politician’s challenge to be all things to all, a marathon, run as a sprint. 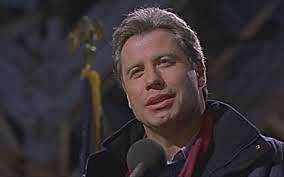 John Travolta is uncanny as Governor* Jack Stanton. In P’s favourite scene, where Stanton addresses a union crowd in a cold, closed-down factory, he seems to be Bill Clinton, and even more chilling, his blather actually moves you. Emma Thompson was never better as the long-suffering Hilary knock-off, and you gain insight from the two leads’ preformance into the power of a driven couple with complementary skills. Adrian Lester, as Henry Burton, a notional Nick Carraway, plunges in to the vortex of the Stanton campaign, romancing political aide Daisy (Maura Tierney), learning from adoptive mother and political dust-buster Libby (Kathy Bates), teaming up with Stanton’s James Carville-style strategist Richard Jemmons (Billy Bob Thornton) and investigating the sordid past of rival Governor, Fred Picker (Larry Hagman, in a star turn). Great scenes abound: The Factory Speech; Jack Stanton has yet another apple fritter at Krispy Kreme; He uplifts illiterates at an adult literacy meeting with fake stories about his Uncle Charlie; He then talks Henry Burton into cutting class tomorrow (“I’m sure the kids won’t mind”); Susan tells Henry that the best people never learn to avoid getting burned; His girlfriend doubts his sincerity; The team has to take up with Mrs Stanton the delicate matter of her husband’s peccadillos; At a thanksgiving party, Stanton boogies (badly) on the dance floor (it takes a great dancer such as Travolta to make such a realistic hash of it); Libby tells Henry what a privileged life he’s led; and then there are the meetings, at Willy’s BBQ place (P must one day go there), interminable hotels, the Governor’s mansion, Neo-Bwana Land…all round, a thick tasty slice of modern American life.